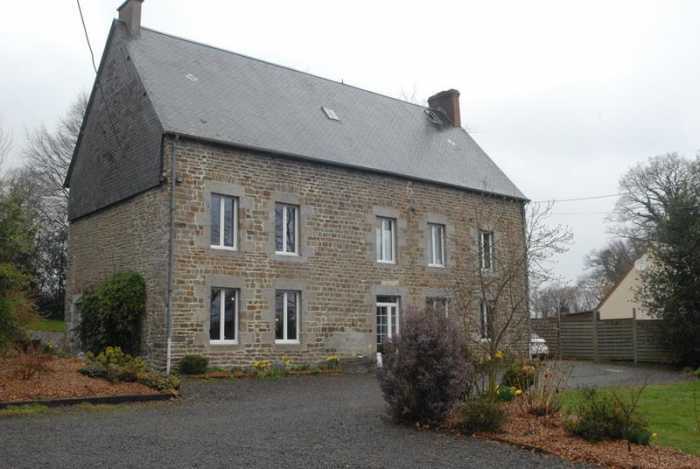 Properties for sale in Normandy, France - AHIN-SIF-00556 Vassy Area 14410 Renovated Manor House for sale in a quiet rural hamlet in Normandy with nearly 2 acres and outbuildings. The property has been extensively renovated by the present owners to create a blend of period and modern features. It is built of stone under a slate roof and has further potential to create additional living space in the loft space. A new all water septic tank was installed in 2014. The property has been re-wired, the floors have been tiled and a bathroom has been installed on the first floor. Wood double glazed windows were installed in 2014. Viewing is highly recommended to fully appreciate the house. Entrance hall : Glazed door and window to the south elevation. Stairs to first floor. Tiled floor. Radiator. Utility room : Window to the rear elevation. Double ceramic sink with mixer tap. Space and plumbing for washing machine. Electrics. 1/2 glazed door to the west elevation. Exposed stone walls and beams. Boiler room : Oil fired central heating boiler. Open plan kitchen/dining room/living room : 9.5m x 6.61m) - Glazed double doors to the west elevation. 2 windows to the south elevation. Tiled floor. Exposed beams. Granite fireplace with woodburner. Built in shelves and deep solid wood window sills. Kitchen area - Window to the north elevation. Range of matching base and wall units and built in 3 ring electric hob with extractor fan over and electric oven. Worktops with stainless steel splashbacks and inset sink with mixer tap. Recess for microwave. Space and plumbing for dishwasher. Breakfast bar. Bathroom : 4.44m x 2.17m - Window to the front elevation. Bath with tiled surround. Vanity unit with mirror and light over. Radiator. Tiled floor. Cloakroom : Toilet. Tiled floor. Landing : Window to the rear elevation. Bedroom 1 : 4.67m x 3.66m (max) - Window to the front elevation. Laminate floor. Built in shelves. Radiator. Bedroom 2 : 3.34m x 3m (max) - Window to the front elevation. Laminate floor. Radiator. Shower room : Tiled floor and part tiled walls. Shower. Hand basin. Extractor fan. Bedroom 3 : 3.66m x 1.76m - Window to the rear elevation. Radiator. Study : 5.5m x 2.71m - Built in cupboards. Radiator. Exposed beams. Laminate floor. Bedroom 4 : 4.49m x 3.66m - 2 windows to the front elevation. Built in wardrobes. Radiator. Exposed beams. En-suite shower room : 3.06m x 2.29m - Window to the front elevation. Door to landing. Dry toilet. Shower. Radiator. Tiled floor. Vanity unit with mirror and light over. Exposed beams. The property is approached via a gravel drive which leads to a detached stone barn with a slate roof divided into a double car port (4.87m x 4.85m); workshop (6.05m x 4.45m) with loft storage space over. Window to the rear elevation. Part concrete floor and sliding wood door to the front elevation. Office/store ( 4.45m x 4m) with window to the rear elevation and glazed door to the front; bread oven. There is a fenced orchard with a field shelter/barn built of cob with a corrugated iron and tiled roof (59m²) which is attached to a stone barn with corrugated iron roof (7m x 5m) with concrete floor and sliding doors to the front elevation. The gravel drive extends to the front of the house with a parking and turning area. The garden is laid to lawn with mature trees and shrubs. Mains water, electricity and telephone are connected. Broadband internet connection. All water septic tank. Oil fired central heating and woodburner.